According to Chilean poet Juan Luis Martínez’s groundbreaking art object La nueva novela (The New Novel, 1977), “The universe is a phantom’s effort to become reality.” In July 2014 I found that phantom. His name is Juan (Luis) Martinez and he is a retired journalist and aid worker for the International Committee of the Red Cross. This Swiss-Catalan writer currently resides in the Valais Alps, 200 kilometers from Geneva, and he had never read more than a passing reference to his Chilean double — which he largely ignored — until I first spoke with him on July 29, 2014. Juan Luis Martínez (Valparaíso, 1942–1993) is widely considered to be the most experimental poet of the Chilean neo-avant-garde of the 1970s and ’80s. During his life he published only two book-objects: the collage work La nueva novela (1977) and the artist’s book La poesía chilena (Chilean Poetry, 1978), which announced the death and burial of his country’s past and future poetic inheritance. Juan Luis Martinez (Palamós, Spain, 1953–), on the other hand, published numerous books of poetry in French from 1973 to 1993, having moved from his native Catalonia to Geneva at the age of four. That their poetic legacies were so intimately and secretly linked for nearly forty years would only become apparent outside of Dimond Library in Durham, New Hampshire in late 2013. And while there are certainly other JLMs of note, even literary and artistic ones — such as an expressionist Spanish painter (Navas de San Juan, Spain, 1942–) and a novelist (1950–, a professor of zoology at the University of Oviedo, Spain) — the Martínez/Martinez case has engendered a transnational literary detective story that revolves around appropriation, translation, and apocryphal authorship. When Juan Luis Martínez died in 1993, he instructed his widow to burn all of his unpublished poems. True to the letter of his wish (but perhaps not to the spirit) Eliana Rodríguez — Brod to Juan Luis’s Kafka — has periodically made public either previously-published texts or larger collections of her late husband’s visually oriented artwork. The first of these publications, collected under the title Poemas del otro (The Other’s Poems), was released by a university press in Santiago ten years after Juan Luis’s death. The second, Aproximación del Principio de Incertidumbre a un proyecto poético (Application of the Uncertainty Principle to a Poetic Project, 2010), includes a series of fifty-five pictograms allegedly composed and ordered according to the precise combinatorial procedures of the I Ching. Finally, in September 2012 — coinciding with an exhibition of Martínez’s objets d’art at the September 2012 Biennial in São Paulo, Brazil — Eliana published the monumental, xeroxed-collage work El poeta anónimo (o el eterno presente de Juan Luis Martínez) (The Anonymous Poet [or Juan Luis Martínez’s Eternal Present]), which commemorated the twentieth anniversary of Martínez’s death with its publication in Chile in March 2013. 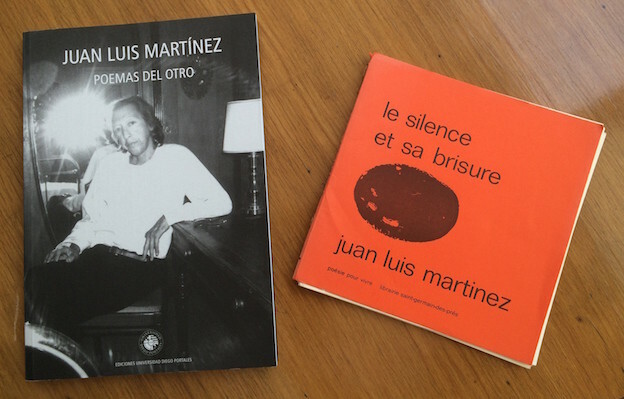 In October 2013 I was revising my book on Chilean poet Juan Luis Martínez — the first English-language monograph on Martínez’s work — when I was struck by the inclusion of a review of a book titled Le Silence et sa Brisure (Silence and Its Breaking) in The Anonymous Poet (or Juan Luis Martínez’s Eternal Present). The review was published in 1976 and describes a work by a Swiss-Catalan poet also named Juan Luis Martinez (with no accent mark); the following page of The Anonymous Poet is comprised of a facsimile of a card catalogue entry for Silence and Its Breaking, taken from the collection of the French-Chilean Institute of Valparaíso. I subsequently used the online library database WebCat (with expanded search parameters) to find out more about this book, which was published in Paris in 1976 by the now-defunct Editions Saint-Germain-des-Prés. Out of curiosity, I requested Le Silence through interlibrary loan, and my surprise when I received it could not have been greater. If the initial poems had a ghostly familiarity to them, they should have: I was shocked to realize that the seventeen poems contained in Silence and Its Breaking were very nearly exact translations of the first section of the Chilean Martínez’s book The Other’s Poems, published posthumously some twenty-seven years later. Upon recovering from my initial surprise, my first impression was that these poems must have been written in French by the Chilean poet, which meant that Poemas del otro (2003) was composed of translations to Spanish of these poems, originally published in French in 1976. Alternatively — as Chilean journalist Pedro Pablo Guerrero later suggested to me via email — I wondered if Martínez had written these poems in Spanish and sent them, clandestinely, to a Chilean friend living in exile in Paris during Pinochet’s dictatorship. With nearly half of the Chilean intelligentsia residing in Paris following the bloody 1973 coup d’état, Martínez very easily could have entrusted the poems and their translation to an exiled compatriot. Or, might the Chilean Martínez have discovered the Swiss-Catalan Martinez and together they collaborated on these poems (as a kind of Situationist joke or prank)? Perhaps “Juan Luis Martinez” was an invention or avatar of Juan Luis Martínez, an orthonym that recalled Portuguese poet Fernando Pessoa’s extensive use of heteronyms. I felt relatively confident that Juan Luis Martinez existed without having any hard evidence to support this assertion. After all, I knew that the Chilean Martínez read French but needed a translator when psychoanalyst and philosopher Félix Guattari visited his house in Villa Alemana in 1991. I also doubted that a well-known bande dessinée (Swiss adventure comics) author such as Daniel Ceppi — with whom Martinez collaborated on two occasions (Ceppi adapted Martinez’s short stories) — would work with a Chilean poet whose French was not up to the task. Plus, I just did not see Martínez as being interested in something like bande dessinée, even as part of an elaborate, multidecade hoax. In the face of these uncertainties, in July 2014 I published a short book in Chile called La última broma de Juan Luis Martínez: no sólo ser otro sino escribir la obra del otro (Juan Luis Martínez’s Final Trick: Not Only Being Other but also Writing the Other’s Work), which summarized my findings and put forth the theory that the Chilean poet translated and appropriated extant works by the Swiss-Catalan Martinez. Chilean journalist Pedro Pablo Guerrero interviewed me for an article in the newspaper El Mercurio, titled “Juan Luis Martínez y su doble” (“Juan Luis Martínez and His Double”), which was published July 20, 2014. Guerrero and I searched high and low for Martinez. We emailed his editors in Geneva and in Paris only to be referred to other editors. A Mr. Michel Moret at Editions de l’Aire in Lausanne provided us with Martinez’s last known address and telephone number in Geneva as well as the lead that Martinez worked for the Red Cross in the 1990s; while the number was out of order and the address was no longer current, we did speak with an acupuncturist/physical therapist named Juan Martinez (the only Juan Martinez in the phone book in Geneva, according to Guerrero), who was definitively too young to be the Swiss-Catalan poet. And an editor at Les Humanoïdes Associés (a major French bande dessinée publisher) gave me Daniel Ceppi’s email address, but he never responded to me. On top of it all, Martínez’s widow was not returning my emails. I desperately needed confirmation of the existence of Juan Luis Martinez. As I racked my brain for ways to track down Martínez’s double, should he exist, I received an email from an Ecuadorian journalist who currently lives in Brooklyn, named María Helena Barrera-Agarwal. She had read Guerrero’s article in El Mercurio and provided me with key information that would fact lead me to Martinez, albeit with some slight geographical detours. She told me a tale of three Martinezes, which she outlined in an article that she would soon publish online: a Spanish painter living in Switzerland, a Chilean poet, and a Swiss-Catalan poet-journalist who worked for the International Committee of the Red Cross. Her short article on “the saga of the three Martinez,” as she called it, mentioned a documentary produced by the ICRC and titled Words of Warriors (2007). Armed with a specific mark of identity to locate this Juan Luis Martinez among thousands of Google hits (since JLM is somewhat of a common name), in no time at all I was watching a Juan Martinez interview armed guerrillas in the South Sudan, El Salvador, the Congo, and the Philippines. I saw my phantom speak. A quick Internet search revealed his current location to be in the Ukraine, as head of the ICRC office in Kharkiv. I called; he had retired a month prior to my call. The potential setback, however, soon dissolved when the new head of the office provided me with Martinez’s personal email address. Martinez answered my initial, vague query overnight, finding it quite a coincidence that I inquired about his literary past because he was seeking to put his old papers and notebooks in order while living in Grimentz, a small village of 500 people in the Valais Alps situated 1,600 meters above sea level and 200 kilometers from Geneva. I responded with a tremendous missive about my multinational search for him, my work on Chilean poet Juan Luis Martínez, and my own largely paranoid and Borgesian speculations as to what it all meant. Earlier that day I had finally spoken with Martínez’s widow on the phone, and she told me that while all of this was news to her, Jacques d’Arthuys — Martínez’s close friend and the director of the French-Chilean Institute of Valparaiso in the mid-’70s — found Le Silence et sa brisure in a bookstore in Paris and passed it along to Martínez, who found the coincidence amusing. The rest was literary history. Whereas Martínez often spoke of “writing the other’s poetry,” this was the operation at play in the lyric poems published posthumously in the volume Poemas del otro (2003). But what critics did not realize is that when he said that he had not written the poems (“fueron escritos por el otro”) he literally meant el otro Martinez. I had Juan Martinez’s full attention at this point, I can only imagine. Having studied his poetry carefully, I also found these thematizations of the figure of the double (á la Pessoa) to be very prominent in his writing. In numerous places he too played with the metaphysical constructions of being and nonbeing, space-time, spirit, etc. Martinez’s initial response to his heteronym’s translation and appropriation was, in his words, “not very friendly.” But shortly he found the case extremely intriguing and even felt very close to J. L. Martínez. He also was struck “that it took more than ten years and a foreign researcher (not a Chilean one) to discover the pot-aux-roses” (a French expression about “revealing something hidden”). We spoke the next day via Skype for an hour and a half or so. Juan was quick to show me the photo of Fernando Pessoa perched behind him on a bookshelf, which he had purchased during a recent trip to Portugal. The conversation was thus initiated under the sign of Pessoa, as was only appropriate due to the Pessoan question of the heteronym that played so strongly into our discussion, as well as in the Chilean poet’s appropriation of his heteronym’s work. Martinez reiterated that at first he was angry when he learned of the appropriation of his poetry, but soon felt a strong connection between the young man that he was when he wrote those poems and his Chilean double. This new connection, he argued, revived or gave life to an aspect of his past that was full of despair and questions but also energy and strength. And while Martinez’s initial reaction to my discovery was not very positive, he recounted to me that by the time we spoke — some twenty-four hours after first learning of Juan Luis Martínez’s appropriation of his poems — he was very amused by the whole affair. When he visited the website juanluismartinez.cl — designed by the poet’s widow and financed by a grant from the Chilean government — Martinez was utterly amazed to see his words appear in Spanish in Poemas del otro. Putting together the pieces of this puzzle and understanding the process of appropriation at play in this poetic gesture, he was pleased that his words were good enough for the Chilean Martínez to take possession of them. While perusing the website, the Swiss-Catalan Martinez realized that he had stumbled across Martínez’s poetry several years ago when looking up a reference. He had read a few lines about La nueva novela but did not pursue the link any further, since for him names and faces do not mean a whole lot. With respect to the deeper meaning of this communion of poets across continents, languages, and borders, when I spoke with Martinez he speculated at first that it was pure chance or hasard, or perhaps a big (’pataphysical) joke of some sort. He reflected upon those words that he composed at the age of nineteen or twenty (including the poem “Qui je suis,” written when he was twenty-one), which were part of what he described as poetry as an absolute approach to life, at a time when writing was more important even than eating (and thus he suffered through some difficult moments, materially speaking). But, argued Martinez, what we call writing (l’écriture) is something poetry cannot do, because it is not life; it is perhaps more than life, he speculated. This “juego” or “broma” (game or trick), however, was part of a game — a serious and even cruel (essential) one — through which the Chilean poet “lived on” and found a desperate way of leaving his body by being himself, but also being more than himself. Juan conjectured that the “encounter beyond death” that brought them together was part of Martínez’s celestial transcendence beyond the confines of his physical suffering from the kidney disease that would claim his life at the age of fifty. 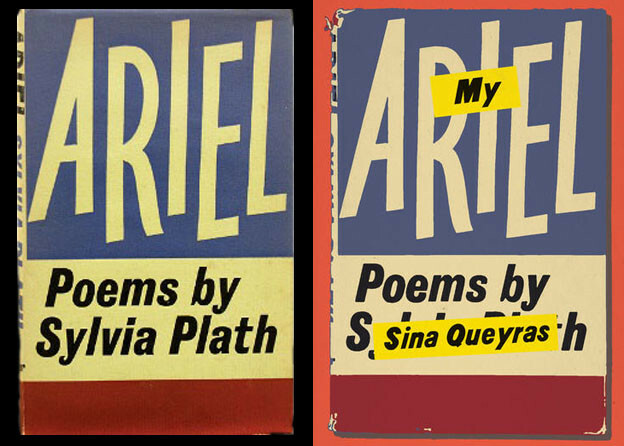 The connection between these two poets transcended their shared name, but it also had deeper onomastic and historical roots than I had foreseen. Whereas the Chilean Juan Luis Martínez inherited his first names from his paternal grandfather Juan and from his father, Luis Martínez Villablanca, the Swiss-Catalan Martinez took his first names from both of his grandfathers. Juan was his paternal grandfather, and his maternal grandfather, Luis, was a poet himself, persecuted during the Spanish Civil War (1936–1939) for being the Republican director of a Catalan newspaper. He was executed via firing squad in early 1941 after being imprisoned in Barcelona for some time, and despite the fact that Martinez never met his literary namesake, he told me first of the importance of both names as part of his poetic and personal inheritance — but quickly went on to describe an ethic of authorial disappearance that was strikingly similar to that of his Chilean counterpart. At the age of twenty-three (in 1976, the year that Le Silence et sa brisure was published), he signed his poems “Xeno,” or “foreigner,” in Greek, since he believed that one cannot appropriate poetry by putting a name on it. At the same time, he realized that he had to put something, so he settled on Xeno. I recalled reading a “Letter to My Double” in the Pessoa-influenced afterword to Franchir la passe où rêvent les guerriers: poèmes (Crossing the Pass Where the Warriors Dream: Poems, 1988), in which Martinez signed off as “Xeno,” in a text that made me wonder at first if in fact the Chilean Martínez was playing a huge prank on unsuspecting readers by inventing a Swiss avatar. When I admitted my suspicions, Martinez merely shook his head and laughed, marveling at the coincidences and the shared poetic ethos that ended up binding these two men together. My conversation with Juan Martinez also shed light on the main unresolved issue that had troubled my search for Martínez’s double: how could I explain the silence of the Francophone Martinez post-1993, since he ceased publishing books the very same year that the Chilean poet died? Martinez found this to be quite ironic, and explained his withdrawal from the public aspects of writerly life to me by referencing Argentine poet Roberto Juarroz, who classified the social functions of literature as “para-literature.” Martinez told me that in the mid-1980s Swiss cultural authorities were quite interested in his work; after all, in 1984 his book Traité des nuits blanches (Treaty on White Nights) was the first unanimous winner of the Genevan Society of Writers Literary Prize. He became tired of the cultural milieu in the early to mid-’90s after years of working as a reporter and also giving literary talks abroad — he mentioned Vietnam and Malaysia — and applied to the International Committee of the Red Cross in 1997. He was accepted despite being married with children and “too old,” as he expressed to me. His first mission was to Kabul, Afghanistan, in 1997 and he stopped publishing at that time, having had several poems come out in literary magazines and journals between 1993 and 2001. But he never stopped writing poetry. Like his double, Martinez has been working for years on a long, unfinished and unpublished poetic project — a poem he began in 1994, with twelve sections of nine parts each (yielding 108 parts in all). He had the chance to publish it with Gallimard about ten years ago with the endorsement of a friend who won the prestigious Goncourt Prize, but he did not want to make the changes required by the editor. He is thus continually writing, rewriting, restarting, and collecting notes and fragments. The importance of our encounter for Martinez, he told me, was not a question of his own vindication. He hoped to reveal the truth to Martínez’s readers, who would appreciate the twists and turns of the entire story. This complex saga of appropriation, translation, and transcendence spans five continents and at least thirteen countries: Chile, the United States, Spain (Catalonia), Switzerland, France, Ukraine, South Sudan, El Salvador, Philippines, Republic of the Congo, Afghanistan, Brazil, and India (where Martinez met Daniel Ceppi). Interestingly, Martinez travelled to Chile in late October 2014 to meet the Martínez family and the public who read his work in (an appropriated) translation for over ten years. He gave talks and readings in Valparaíso and participated — alongside myself, Pedro Pablo Guerrero, Cristóbal Joannon (Poemas del otro’seditor), and two academics who have written extensively on Juan Luis Martínez (Felipe Cussen and Matías Ayala) — in a panel discussion about “el caso Martínez” at Santiago’s prestigious International Book Fair, the country’s largest literary event. The “Martínez affair,” I believe, is less important for what it highlights about either JLM; rather, it is significant for the way it speaks to the question of originality in literature, the role of translation, and also, the humanity of writing itself as an inhuman force. After all, where Martinez has brought out aspects of Martínez’s writing through their communication across time, languages, and national traditions — and vice versa — what brings them together becomes clearer even as the identification of the original and the copy becomes more and more problematic and uncertain. As Juan Martinez himself asserted, this relation or synchronicity implies a transcendence beyond a mere joke or trick: in what he described as “Martínez’s literary suicide,” we find the radical (Chilean) poet’s reinscription as an author in the face of the impossible challenge of disappearing behind a veil of words. And this would have been “the perfect crime,” according to Juan Martínez, had The Other’s Poems and The Anonymous Poet not insisted on the poet’s necessary failure to disappear absolutely. In the end, this is the punch line of Martínez’s final trick: becoming even more Martínez in poems written by another Martinez. 1. Juan Luis Martínez, La nueva novela (Santiago de Chile: Ediciones Archivo, 1977), 152. 2. Juan Luis Martínez, La poesía chilena (Santiago de Chile: Ediciones Archivo, 1978), 40. 3. Juan Luis Martínez, Poemas del otro: poemas y diálogos dispersos (Santiago de Chile: Ediciones Universidad Diego Portales, 2003), 113. 4. Juan Luis Martínez, Aproximación del Principio de Incertidumbre a un proyecto poético (Santiago de Chile: Ediciones Nómade y Galería D21, 2010), 62. 5. Juan Luis Martínez, El poeta anónimo (o el eterno presente de Juan Luis Martínez) (Sao Paolo: Cosac Naify, 2012). 6. Scott Weintraub, Juan Luis Martínez’s Philosophical Poetics (Lewisberg: Bucknell University Press, 2014). 7. Juan Luis Martinez, Le Silence et sa brisure (Paris: Editions San-Germain-des-Prés, 1976). 8. Juan Luis Martínez, “Quien soy yo,” “Mañana se levanta,” Revista de libros, El Mercurio, April 4, 1993: 8. 9. Scott Weintraub, La última broma de Juan Luis Martínez: ‘no sólo ser otro sino escribir la obra de otro’ (Santiago: Cuarto Propio, 2014). 10. However, Martínez’s older daughter, Alita, told me that she has known of her father’s appropriation of his “double’s” poetry for decades. As a child, she was fascinated by the book by “her other father” in the family library, and she would spend hours imagining what he looked like, what kind of person he was, etc. At the same time, while in Paris, Juan Luis Martínez envisioned crossing paths with the author of Le Silence et sa brisure at every turn — not out of fear but as a product of the strength of their “relation” across time and space (conversation with Alita Martínez, November 5, 2014). 11. “Juan Luis Martínez,” official website. Designed by Daniela Berdichevsky Milinarsky and Eliana Rodriguez Labra. 2011. Accessed January 15, 2015. http://www.juanluismartinez.cl. 13. Juan Luis Martinez, Franchir la passe où rêvent les guerriers: poèmes (Lausanne: Le Castor Astral, 1988). 14. Juan Luis Martinez, Traité des nuits blanches: poèmes (Lausanne: Ed. de l'Aire, 1986).